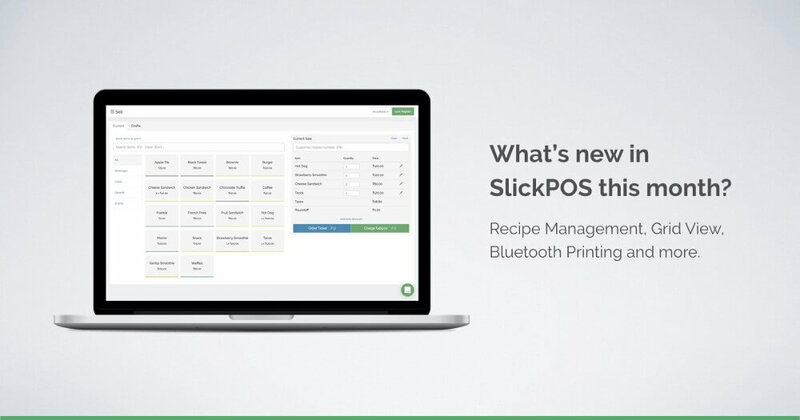 Here’s a roundup of the new features we have rolled out to SlickPOS this January. If you don’t see the new features in your account, follow these instructions to get the updates. If you are new to SlickPOS, signup now and get SlickPOS for free. You can also send us a message on live chat and we’ll be glad to help out and show you a demo. You will now be able to add inventory specific products like raw materials and semi-finished products from the Inventory app’s “Manage Items” page. There’s a new “Edit Recipe” option along with the items displayed in the Manage Items page – with which you can link the ingredients. Once the recipe is setup, depending on your recipe setup, the ingredients will be consumed either at the time of sale or when the product is prepared and stocked. If you run a food business, managing recipe is the best way to control pilferage. The recipe management feature also allows you to bunch up products and sell them as a combo. You can create a combo product in the POS and link the constituent products as ingredients from the inventory app’s recipe management page. When you sell the combo item, inventory for the underlying products are automatically adjusted. Bluetooth printing is one of the most sought after features by our food truck POS customers. Make sure you get a compatible bluetooth printer like the Bixolon’s mPOS SPP-R210 or SPP-R310, pair it with your Android device and then select the printer from the SlickPOS android app. If you need help regarding selecting a bluetooth printer for your POS or setting it up, just ping us on the website chat. While we got good feedback on our web POS being keyboard friendly we also got requests to support a grid view for touch based operability. Now you can setup up your default preference as either grid view or list view from the “Setup Preferences” page. We hope that you liked the new updates, do send us a message if you have any suggestions for us. See you again on February with the next round of updates!